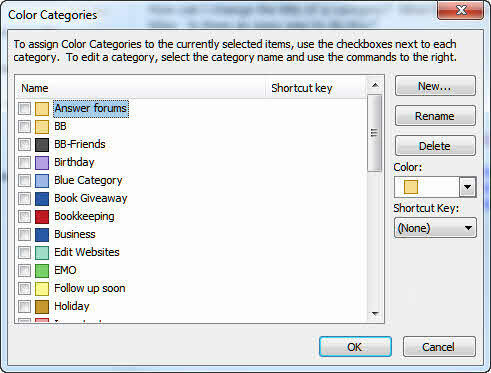 Outlook has always supported categories and Outlook 2007 introduced Color Categories by merging the short-lived colored flags with categories. This page sums up a few things I've learned about Outlook categories and color categories, with suggestions for using and managing categories along with troubleshooting tips. You can assign one or more categories to any Microsoft Outlook item and consistent use of categories makes it easier to locate specific items. Outlook does not use the registry for a master category list; they are stored in the default message store (mailbox or pst). If you are setting up a new system and using your old pst the color categories will be available on the new system. If you imported from an old data file, right click on the root folder (Outlook Today), choose Properties and click the button to Upgrade to color categories. This will assign random colors to the categories assigned to items in your data file. The same path in the CURRENT_USER hive also works. Note: if you remove a category name from the registry key (or edit the name in the registry), it remains available in the Category list (ex. misspelled Cateory 1 in my screenshot). To print a list of the category names and their colors, we have a macro and instructions Print a list of Categories and their Colors. 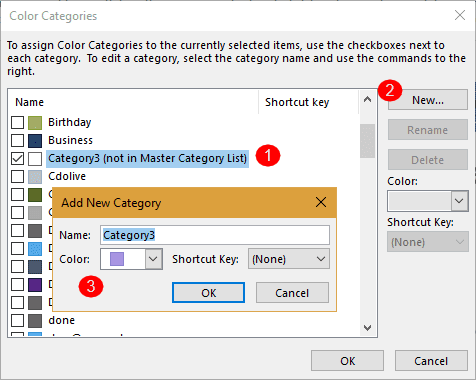 Unlike with older versions, you cannot paste a comma separated list of categories into the master category dialog and add them all to the Outlook master list. With the exception of the All Fields page of an Outlook contact, the only way to add categories to items is using the Category picker menu or dialog. You can use the All fields page to bulk add categories to Outlook 2007 or Outlook 2010. Color categories are not available in IMAP accounts by default, since they are not supported on all IMAP servers. However, there is a way to add color categories to IMAP messages. See Outlook Categories, Flags, and IMAP Accounts for more information and the workaround. If you need to include the categories all the time, use the SendPersonalCategories registry entry. Exchange admins can configure Exchange to remove categories. If you use Exchange and it's configured to remove categories, adding the key to Outlook will not work, you'll need to speak to your admin. This key works with Outlook 2003 and up, you'll need to use the correct path in the registry for your version. This can also be set using Group Policy; look for it in the Office adm files, under Outlook > Miscellaneous. Create the key or path if it does not exist. If you don't want to edit the registry yourself, download and run the registry file for your version of Outlook. Remember: if you set this key, the categories will be included on the sent message and the recipient will be able to see the category (unless the recipient uses a rule to remove categories from messages they receive). Only categories are visible on items when you share folders on Exchange server; colors are per user. Other users will see your categories in a white color (unless it's already in their color category list). Outlook will assign the next unused color; change the color and set a shortcut key, if desired, then click Save. To add, remove, rename, or assign shortcuts to categories, expand the category selector and choose All Categories from the end of the menu to open the Color Category dialog, shown below. Select the category on the left then the appropriate button in the dialog to add, edit, delete categories, or assign colors or shortcuts to categories. You cannot add categories in bulk using this dialog. While you can bulk add categories to any item in older versions of Outlook by typing in the category field; beginning with Outlook 2007, you need to use the category menu or dialog to select categories. Also possible in older versions, you could type (or paste) a comma-delimited list in the master category dialog then add the list to your master list. While this is not possible to do from the master category list in newer versions of Outlook, it is possible to type a list of categories and add them to the master list. Open a contact form and switch to the All Fields page. Select Frequently used fields from the Select from menu, then type (or paste) a comma-separated list of categories into the Category field. Q: How do I reset the categories? This will remove all categories from the master category list and restore the default category placeholder names (Red Category, Blue Category etc). This will not remove the categories from individual items. To remove categories from Outlook items, create a search folder to find the items that have categories assigned then remove the categories using Select All, then right click and choose Clear All Categories. If you decide you want to restore the categories to the master list (and haven't deleted them from the items yet), use Upgrade to color categories. In Outlook 2003, go to Edit menu, Categories, Master Category List. Click Reset and close the dialog. Q: How is the Category list organized? A: When you expand the Categories button, the flyout is ordered by the most recently used categories. If you click All Categories to open the Color Categories dialog, the list should be alphabetical. In current versions of Outlook, beginning with Outlook 2007, the master category list is stored in the Outlook data file. If you use a pst file and move the pst file to another computer, you'll keep your categories. If you use Exchange server, including Office 365 email or Outlook.com, your categories are stored in your mailbox. In Outlook 2003 (and older) the master category list is stored in the Windows Registry. Each user has a different category list. Run Regedit and go to HKEY_CURRENT_USER\Software\Microsoft\Office\11.0\Outlook and select the Categories key. Choose Registry | Export Registry File to make a copy of the Categories branch of the registry. Note that this list is in Unicode encoding and is not compatible with versions other than Outlook 2002. To use any of these methods to move categories to another computer using a compatible version of Outlook, you'll need to change the version number in the key before importing. You can use this exported branch to distribute a category list to other Outlook users. See the MSKB article How to Migrate Custom Categories to Other Users. CAUTION: Using a .reg file to propagate a category list does not update a user's own list; instead it completely replaces it. I personally do not recommend this method, because it eliminates much the utility of the Category feature for users. See the next section for what I think is a better method. If you remove a category from the master list, any items marked with that category are not affected. In the Categories dialog box, that category is listed as "(not in master list)." I'm convinced that many people worry too much about keeping the Master Category List consistent from user to user, when what they really want is to keep the categorization of the items themselves consistent. It is critical to remember that the category set on an individual item is totally independent of the user's Master Category List. For example, you can set a category of Blue on an item, then delete Blue from your personal Master Category List. The item is still categorized as Blue. In the Categories dialog, you should now see its category as "Blue (not on master list)." Anyone who has never had Blue on the master list will see the same thing. Yes, it would be nice if Microsoft had made this easier, but the real issue usually is making category assignment consistent. In a public folder, consider handling that with a custom form that forces users to pick from an "official" list of categories. I've put together a sample form at Required Categories Contact Form. Another approach would be to use code behind the form to make category assignment automatic based on the value of other fields in the form. One situation where the Master Categories list makes a difference is when you are working with a large folder and dragging a large number of items between categories. When a category is not in the Master List, you risk losing the original categories from items added to new categories. You can avoid problems by dragging fewer items at a time or select the items, right click and choose Categories. On the More Choices tab in the Filter dialog, type the names of the categories separated by "AND" Do not use the Categories button. For example, to display contacts who are in both the Personal category and the Business category, type in "Personal AND Business." In Outlook 2007, use the Advanced tab to create the filter. Use Categories for the Field, select contains as the Condition and enter the category names, separated by AND in the Value field. The QueryBuilder can be used to create the AND filter if you use Outlook 2002, 2003 or 2007. See Using QueryBuilder for more information. To remove categories from incoming messages, create a rule and choose the condition to "clear messages's categories". If you use an older versions of Outlook, Rules Wizard doesn't have an option to remove categories from messages you send or receive, it can only add more categories. You'll need to use VBA to remove categories. Visit OutlookCode for assistance with Outlook programming. Note that this section does not apply to Outlook 2003/2007/2010. In any of these newer versions you can filter or group by category, select the contacts in the category and start the mail merge using Tools, Mail merge. Select Contacts by category using a filter, copy all matching items to a new Contacts folder, add that folder to the Outlook Address Book, and use it as the mail merge source. See the MSKB article Q160521: Categories Unavailable to Mail Merge in Word. Also see Helen Feddema's Code Sample 48 for a VBScript routine to do the copying to another folder for you. You can use Excel to drive a bulk mailing based on a category. See the Microsoft article Using Microsoft Excel To Do a Bulk Mailing in Microsoft Outlook. Some of the third-party mail merge tools also support merging by category. See Microsoft Exchange and Outlook Distribution Lists for details on how to use categories to create instant Personal Distribution Lists. You can use categories in Rules Wizard rules, both as part of conditions and as actions, assigning one or more categories to an item. For example, I used to use an autoresponder to handle subscription requests for my Exchange Messaging Outlook newsletter and marked the incoming requests with a category of "Response sent." If you create a new Outlook item from another item, the categories carry over. Back to the autoresponder example: I manage the mailing list in a Contacts folder that uses a custom form. New items are created by dragging the incoming message to the folder. When the new recipient is created, it has the category of "Response sent." This also works with replies and forwards; as long as you send in RTF format, the recipient will see any category you apply. Helen Feddema's Code Sample 55 demonstrates how to use an Outlook form to display all contacts by category. It's up to you to take the next step of writing code to do something with all those contacts. You can't create a view that shows both categories and subcategories. In other words, the Categories field can be used for grouping just once. What you might try is a set of categories that themselves include a subcategory: Friends - Good, Friends - Very Close, etc. You can't search and replace a category directly without writing code. However, you can select a bunch of categories, then right-click, choose Categories from the pop-up menu and work with the Categories for the entire group of items. We have a report that GoContactSync (an Outlook/Gmail sync utility) resets the master category list. Categories are not removed from the Outlook items, but the categories are shown as "not in master Category". Although knowing the names of the colors is less than useful for most users, they are in the Object model as OlCategoryColor. The 25 color names are as follows. To print a list of the category names and their colors, see Print a list of Categories and their Colors. ReliefJet Essentials for Outlook is a large set of useful and easy-to-use tools for every Microsoft Outlook as well as Exchange Server users. The latest 4.12 version introduces three more utilities, improves most of the existing utilities and fixes all issues found to the moment. It also improves performance when selecting Outlook folders. All ReliefJet macros now allow you to take the raw value "as is". This enables you to insert HTML code snippets to message bodies. Categories Administrator was specifically designed for users to easily administer Master and Individual Contact Categories in Outlook/Exchange/BCM. Add, rename, merge, remove, delete, import, and create categories in Outlook/Exchange/BCM. Create a query and then map it to the selected contacts. Categorize Plus enables users to categorize and search Outlook items using a selectable menu hierarchy. Categorize Plus also allows user to automatically process emails by creating Category Actions. In addition, Categorize Plus will automatically assign categories to items as they arrive in your Inbox or any other folder that you choose. Categorize Plus also includes a dock-able Category Editor that is used to quickly edit item categories and commands to copy/paste categories and to undo/redo categorizations. Available in both Free and Paid versions and works with Outlook 2003/2007/2010. This first release displays all categories in one menu and contains all of the basic functionality of the new "Categorize" button for Outlook 2013. Exchange Category Manager is a plug-in for Exchange Server and Office 365. It enables you to manage the Outlook categories and colors that are available in Outlook. Define an unlimited number of groups with different users. Each group can have it's own set of categories and colors to choose from. You can add categories to the existing category list that a user has in Outlook or replace everything with the predefined list. As it integrates with Exchange server directly, the users do not have to do anything, their category list is automatically managed. No software has to be installed on the client pc's. SimplyTag helps you categorize Outlook messages quickly and efficiently. It learns about your tagging patterns and enables you to assign the right tag to a message literally with a single click. Works on sent and received messages. Also support searching messages by categories. Hi I use multiple inboxes each have emails colour categorised to me, is there a way to get all of these emails to appear n my personnel inbox so instead of checking all inboxes any that are categorised to me in any of the inboxes will be in my personal inbox? The only way would be if you downloaded the mail using POP3 - then you could deliver all of the mail to one inbox. The other option is using Instant search to show all new mail in all mailboxes. I use each color to represent an approver for emails containing bills for my A/P system. Our company is growing rapidly, we are virtually paperless and I'm going to be out of colors very soon. Is there a way I can expand the list of color shades, like the huge one that Excel has? This system of assigning colors to approvers works so well, I have approvers all over the world and can easily keep track of who approves which invoice. Until then, you'll need to reuse colors- use the same colors for similar category names. Possibly. What information do you need? We can get the count of categorized messages and what the category is. Diane, is there a way to copy the categories used on one email to another? When I get a reply from someone, I want to categorize it in the same way as the original email, but have had to do this manually so far. I thought replies picked up the category... maybe it was only if you set the category before the reply, but there is so much that can go wrong even if you do that. Do you choose the category based on factors in the message or assign a specific category to the sender? I have a macro that picks the category from the person's contact and assigns it to all messages from that person. The categories are stored in the default data file or pst, so you shouldn't have lost them, unless you reconfigured your outlook profile or created a new pst. Exchange accounts, outlook.com and office 365 mailboxes sync categories back to the server, so they shouldn't be lost if you create a new profile. Diane - I'm wondering if you know of a way to keep categories on items that you want to archive but want to come back to later. I am an instructor at a local college. I have categories created for each of my classes which I use for task and calendar items. In the past I have simply removed the categories from my master list so the old categories don't clog up the list so my current class categories are always at the top (I put a zero as the first character to keep them at the top). Now I have started keeping information in the calendar I will want to refer back to so I'm hesitant to remove the category since I won't be able to view all the calendar items for that class quickly with a "view". I've run into tons of problems when I 'rename' categories so I'm nervous about the obvious simple solution. removing the categories from the master list doesn't remove them from the individual items - they won't be colored (all will be 'white' or no color) but can be grouped by category or found using search. How do you sync Outlook contact categories to the iphone or other mobile devices? We have Microsoft Office 365/Exchange 2016. Are there any iphone apps or Microsoft Products/Upcoming releases that can do this? We have heard of DejaOffice/CompanionLink, but were wondering if there were any more recent solutions/apps considering there must be a vast amount of users who want/need this functionality. We have done a lot of research on this and haven't been able to find anything else that will sync with Office 365. Thank you tremendously! You can't at this time. Categories are not currently supported in the default mail apps or in outlook app... sorry. Deja and the Touchdown app support categories - not sure about others. Is there any way for only 1 person to be able to assign categories per team ? I would like to stop other people from assigning categories. Currently 13 people are able to assign items but I would like to make it so only 1 person can do this. Is there a way of changing the permissions per user ? This would be for a group inbox with multiple users. You can't restrict categories specifically, but it might work to remove some permissions (like edit permissions) - however they would likely lose the ability to do much more than view the messages, which may defeat the purpose of giving them access.